A limp sandwich filled with life’s off meat. I’m the sandwich filling. I’ve covered that. Squashed between caring for a (currently disintegrating) young family, and a (currently struggling) elderly family, my job is to be the lick of jam that makes their lives sweet and tasty. Sometimes I feel like a gourmet filling, and sometimes I feel like an unrecognisable grey meat-like substance you see in a filling station in the middle of nowhere. Today’s special is even worse than that. Things at home are so fraught, the tears on my face for the tear in my life is stretching, straining, strangling me. My ‘Not Quite’ (not quite a husband not quite an ex) has to move out. We cannot work through a separation and continue to live together. If we want to attain what we need to attain for the sake of our girls, I need space to grieve and hate, then rebuild and forgive. So I have asked him to leave. And although I know absolutely that is the best thing, the pain of knowing when he walks out that door in a week or so, he will be shutting it on 20 years of love and 10 years of marriage, and no matter how awful some of those years have been, the pain is breathtaking. And not in the beautiful way. I want to be able to maintain a semblance of family for my girls, so amidst the adjustment of being with me, or being with him, I want there to be times we can still all be together. I know that is not for everyone, and will be monumentally hard, but this is not their fault and I never want them to feel they are fractured. I want them always to feel part of a family, however that family will now look. For that I need peace of mind, and I can’t get that when he is in the home and we are dancing a deathly dance of defeat, where the beat is thumping my heart to death. I’ve left my children this weekend because it is too painful being with their father. I am looking after my Mum who can’t say my name, and so doesn’t know my pain, because what is the point of making her life any worse than it already is? So I smile, and scrape the nose pickings out of her nails, wash her teeth and clean their house and wish more than anything my old Mum could come back and hold me like she used to, and make me a cup of tea and for a few moments, make everything feel ok. I got the worst of parenting this weekend. A splintered phonecall of nothingness from children who are tired and fraught and distracted, and then later, a shattered phonecall from Ruby who desperately needs me and screams hysterically at me from 200 miles away to please, mummy, please come home. I am left to sing her a lullaby through the phone. But this weekend I realised that being strong is what I am. It is who I am. And I am proud of it. I am strong, and yes, I am hurting. But I am not hard. I am loving and that is what makes me strong. And that is what this marriage took from me. The belief in my loving strength. And that is what I am reclaiming. I am strong and I love and protect the people around me, even when I’m hurting. I am protecting my Mum. Because I am strong and loving. I am protecting my girls. Because I am strong and loving. I am even protecting him, keeping his story hidden until he is ready to tell it. 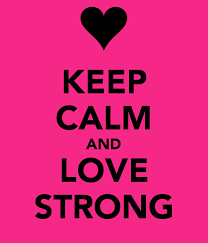 Because I am strong and loving. My marriage is over and I’m left with three children, debt and a cold sore. But I’m reclaiming my loving strength. My filling just got a bit of chutney. 2 Responses to And Today’s Special is…. Alana, I am so grateful to you for your openness during this agonizing time. While — as you know — I’m going through a divorce on this end as well, I don’t have the other side of this pain sandwich — what is essentially the loss of your mother, while caring for her. My heart hurts for you. My own mother is on the other side of the US, but we are able to Skype and chat and I don’t know what I would do without that. I hope that you have other strong support in dear friends and neighbors.